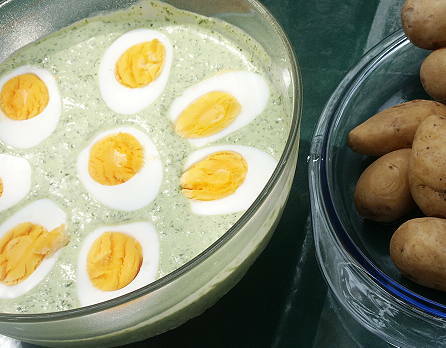 It was one of Goethe's favorite dishes: boiled potatoes and eggs with green sauce. The healthy-green sauce came from France where it was called "Sauce verte". In Italy is is popular under the name "Salsa verde" and in Germany it is a specialty of Frankfurt. There they call it "Grie Soss" which means "Gruene Sosse". You can make it in two different variations but both are containing a minimum of 7 different herbs. It is not that easy to get all of them in the USA. The best is always to buy the seeds and grow your own herbal garden. Back in the time of Goethe, the chopped herbs were for a while in a mix of oil and vinegar, added mashed egg yolk, spices and sour cream to it, then squeezed through a sieve. The green sauce should show the color green, if it is not, then add some spinach juice. Enjoy this original German and traditional recipe - Happy Cooking! (in German Borretsch, Petersilie, Dill, Schnittlauch, Pimpinelle, Kerbel, Sauerampfer, Kresse - this is the classic combination for the green sauce). (in German Borretsch, Petersilie, Dill, Schnittlauch, Pimpinelle, Kerbel, Sauerampfer, Kresse). Mix all ingredients, place them in a fridge for 1-2 hours. Serve with boiled beef (or Tafelspitz), boiled potatoes (Salzkartoffeln) or fried potatoes (Bratkartoffeln). Parsley chives? You’re talking about parsley, right? Or chives? you would use parsley and chives. 6 tbsp chopped herbs: borage, parsley, chives, sorrel, cress, salad burnet, chervil (you can also use dill instead of borage, and tarragon instead of salad burnet). I made it without burnet and borage, could not find it here. If it should have a green color add some spinach too.